On the first day of Unleavened Bread, when the Passover lamb was sacrificed, his disciples said to him, ‘Where do you want us to go and make the preparations for you to eat the passover?’ So he sent two of his disciples, saying to them, ‘Go into the city and you will meet a man carrying a pitcher of water. Follow him, and say to the owner of the house which he enters, “The Master says: Where is my dining room in which I can eat the passover with my disciples?” He will show you a large upper room furnished with couches, all prepared. Make the preparations for us there,’ The disciples set out and went to the city and found everything as he had told them, and prepared the Passover. After psalms had been sung they left for the Mount of Olives. 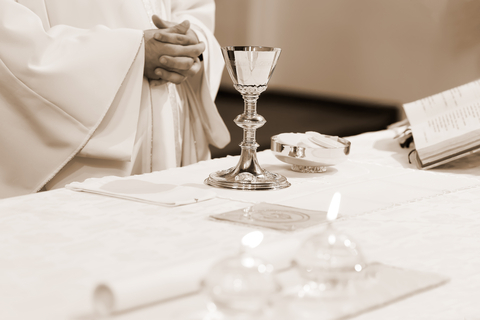 The feast today highlights the central place of the Eucharist in Christian life. It is unique to our christian faith that God becomes present in a real way in ordinary bread and wine – food for the journey of life in the bread, energy and joy for the journey of life in the wine. Bread and wine were very much part of the ordinary food of the people of his time, and also of the religious life. People would remember the bread in the desert and the wine of the coming of the Lord. Each time we come to Mass, we recall in a real way the death and resurrection of the Lord. We take part in it, within our place and time. The sacrifice of Christ on the cross and his resurrection is ‘redone’ among us. It is a place and time of grace. The Mass links us with our ancestors in faith. People of certain generations remember the huge Corpus Christi processions which brought the body of Christ into the streets of the parish. The body of Christ is still in our streets because we are there. So this Eucharist is not to commemorate something that happened many years ago. It is our faith and commitment to Christ in his people. All of us are tabernacles of the Lord, and our call is to allow God into our lives, and let God out of our lives. It is sometimes easier to believe in the presence of the Lord in the tabernacle than among each other. Jesus asks us to share the bread and cup. To proclaim this ‘mystery of faith’ for all time. We proclaim today that the Jesus of the tabernacle is the Jesus within all of us. Maybe we should all carry a little red light in front of us as there is a light at the tabernacle to highlight that in each of us, God dwells in Jesus Christ. This entry was posted in Gospel of Mark, Gospel Reflection, Liturgy Resources, Prayer Resources, Scripture, Year B and tagged Body and Blood of Christ, body of Christ, Bread and Wine, Corpus Christi, Corpus Christi Procession, Corpus Christi Year B, death and resurrection of the Lord, Donal Neary SJ, Eucharist, Feast of the Most Holy Body and Blood of Christ - Corpus Christi 2015, Jesus Christ, Mark 14:12-16. 22-26, Mass, mystery of faith, Sunday Gospel and Reflection for 7th June 2015, tabernacles of the Lord, Unleavened Bread. Hello! Your gospel reflections always make my day! Your emails are full of wisdom and hope. Though as a human I sometimes steer away from my faith, your weekly reflections always bring me back and allow me to connect with our Lord. I want to thank you for putting so much time an effort in these reflections.